Before you can have a sensible conversation about hooves with your hoof care professional, you need to know and understand the names of the main structures of the hoof. Without this basic knowledge, your hoof care provider might as well be talking a foreign language. The outside of the foot is familar to horse owners. There are only a few key structures that we really need to understand. 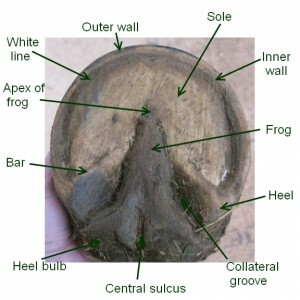 From the outside, most of the hoof is surrounded by the hoof wall. Near the hairline, a slightly softer structure, called the periople is to be found. The periople functions much like our cuticles, protecting the new hoof wall for it’s first couple of months of growth. Just about where the hoof meets the hair is the coronary band. 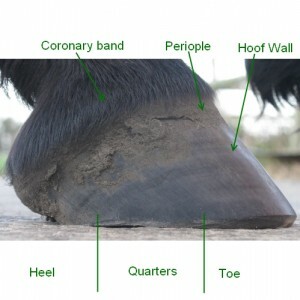 The coronary band is not visible in a live hoof, but can be felt when running your fingers around the hairline of the hoof. To enable us to talk about the hoof and locations on the hoof, we divide it into three sections, the toes, the quarters and the heels (the diagram shows these divisions). The bottom of the hoof should be familar to all horse owners, but not everyone will have seen a nice healthly barefoot hoof. The image here is of one of my mare’s feet- she has never worn shoes. It is not perfect (we haven’t found the perfect hoof yet), but is well on the way and is capable of travelling across most surfaces. 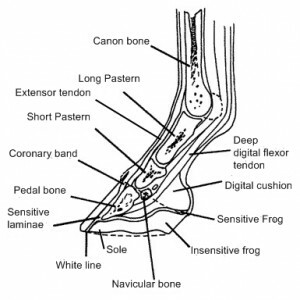 The structures that are visible shod or not are the sole, frog, central sulcus, heel bulbs and collateral grooves. The bits that many horse owners have never seen are around the edge of the foot – the angle of the bars (heel), the outer and inner walls (the outer wall is often pigmented but the inner wall is normally a creamy colour and the white line (which when clean is often yellow, but in this image is filled with dirt). These structures have not just evolved randomly, they all have a specific part to play. If you would like to know more about the functions of the different areas of the hoof, have a look at this page. The anatomy inside the leg is likely to be much less familar to most horse owners. Horses have a single digit on their limbs (the hoof), this being equivalent to the middle finger or third toe of a human limb. In scientific terms the bones have the same names as the equivalent bones in humans, but for now, we will just look at the most common names used. Starting just below the fetlock joint is the long pastern bone, this connects to the short pastern bone which together form “the pastern”. The bottom of the short pastern is just below the top of the hoof wall. The short pastern sits above the pedal bone (AKA coffin bone in America), just behind this joint is where the navicular bone can be found. The pedal bone is attached to the hoof capsule by laminae. Sensitive laminae grow from the pedal bone interleaved with the insensitive laminae of the hoof wall. It is these laminae that are affected during a laminitis attack. All the bones are firmly joined to each other by ligaments and the bones are joined to muscles via tendons. The main tendons in the lower leg of the horse are the digital extensor tendon that runs down the front of the leg and the superficial and deep digital flexor tendons that run down the back of the leg. The extensor tendon and deep flexor tendon both attach to the pedal bone and respectively extend and bend the whole lower leg. The superficial flexor tendon attaches to the top of the short pastern bone.